Prop 0 Cleared for Circulation	changes requirements for certain property owners when transferring their property tax base to replacement property. initiative constitutional amendment and statute. Prop 0 Cleared for Circulation	repeals law requiring certain law enforcement to collect and report specified data on stops and searches. initiative statute. Prop 0 Cleared for Circulation	eliminates certain 2011 criminal justice measures. initiative statute. Prop 01 Cleared for November Ballot	sb 3 (chapter 365, statutes of 2017), beall. veterans and affordable housing bond act of 2018. Prop 03 Cleared for November Ballot	authorizes bonds to fund projects for water supply and quality, watershed, fish, wildlife, water conveyance, and groundwater sustainability and storage. initiative statute. Prop 04 Cleared for November Ballot	authorizes bonds funding construction at hospitals providing children?s health care. initiative statute. Prop 05 Cleared for November Ballot	changes requirements for certain property owners to transfer their property tax base to replacement property. initiative constitutional amendment and statute. Prop 08 Cleared for November Ballot	authorizes state regulation of kidney dialysis clinics. limits charges for patient care. initiative statute. Prop 09 Cleared for November Ballot	division of california into three states. initiative statute. Prop 10 Cleared for November Ballot	expands local governments? authority to enact rent control on residential property. initiative statute. Prop 11 Cleared for November Ballot	requires private-sector emergency ambulance employees to remain on call during work breaks. changes other conditions of employment. initiative statute. Prop 12 Cleared for November Ballot	establishes new standards for confinement of certain farm animals; bans sale of certain non-complying products. initiative statute. Prop 17-0042 Cleared for Circulation	establishes new standards for confinement of certain farm animals; bans sale of certain non-complying products. initiative statute. Prop 17-0044 Undergoing Signature Verification	restricts parole for non-violent offenders. authorizes felony sentences for certain offenses currently treated only as misdemeanors. initiative statute. Prop 17-0051 Cleared for Circulation	expands requirement for supermajority approval to enact new local government revenue measures. initiative constitutional amendment. Prop 17-0052 Cleared for Circulation	regulates various substances and practices related to agriculture, consumer products, and health. initiative statute. Prop 17-0053 Cleared for Circulation	increases the number of candidates in general elections for state and congressional offices. initiative constitutional amendment. Prop 17-0054 Cleared for Circulation	allows for jury trials in child-custody and dependent-child determinations. initiative statute. Prop 17-0055 25% Signatures Reached	requires certain commercial and industrial real property to be taxed based on fair-market value. dedicates portion of any increased revenue to education and local services. initiative constitutional.. Prop 18-0001 Cleared for Circulation	requires a vote in 2021 on whether california should become an independent country. initiative statute. Prop 18-0002 Cleared for Circulation	requires use of state and local law-enforcement resources for federal immigration purposes. restricts voter registration process. initiative statute. Prop 18-0003 Cleared for Circulation	allows new types of gambling in california. initiative constitutional amendment. Prop 18-0004 Cleared for Circulation	establishes public health fund by enacting dedicated statewide tax on distribution of sugar-sweetened drinks. initiative constitutional amendment and statute. Prop 18-0009 Cleared for Circulation	referendum to overturn a 2018 law that replaced money bail system with a system based on public safety risk. Prop 68 Cleared for June Ballot	proposition 068 - sb 5 (chapter 852, statutes of 2017), de leon. california drought, water, parks, climate, coastal protection, and outdoor access for all act of 2018. Prop 69 Cleared for June Ballot	proposition 069 - aca 5 (resolution chapter 30, statutes of 2017), frazier. motor vehicle fees and taxes: restriction on expenditures: appropriations limit. Prop 70 Cleared for June Ballot	proposition 070 - aca 1 (resolution chapter 105, statutes of 2017), mayes. greenhouse gas reduction reserve fund. Prop 71 Cleared for June Ballot	proposition 071 - aca 17 (resolution chapter 190, statutes of 2017), mullin. ballot measures: effective date. Prop 72 Cleared for June Ballot	proposition 072 - sca 9 (resolution chapter 1, statutes of 2018), glazer. The County of San Diego was established on February 18, 1850, as one of the original 27 counties of California. The newly created County covered nearly 40,000 square miles including the present counties of San Diego, Imperial, Riverside, and San Bernardino, along with the eastern portion of Inyo County. The territory comprising San Diego County was under Mexican rule from 1821 until 1846 during which time private land grants covering 948 square miles were bestowed throughout the County. The grants resulted in the formation of private ranchos, some of which are recognizable areas today, such as Rancho Santa Fe(Rancho San Dieguito), Marine Corps Base Camp Pendleton (Rancho Santa Margarita y Las Flores), Rancho Santa Maria (Ramona), and Rancho El Cajon (El Cajon, Lakeside, Santee, and Bostonia). Many ranchos were transformed into incorporated cities; for example, National City and Chula Vista were formed from Rancho de la Nación. Today, the County includes 18 incorporated cities, but retains a large unincorporated area. 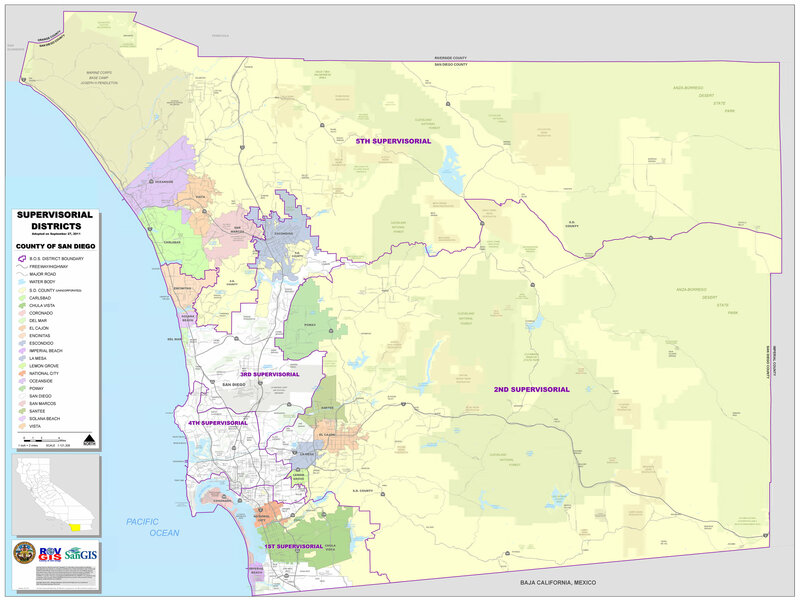 San Diego County, including incorporated cities, contains approximately 4,261 square miles that cover 65 miles north to south and 86 miles east to west. 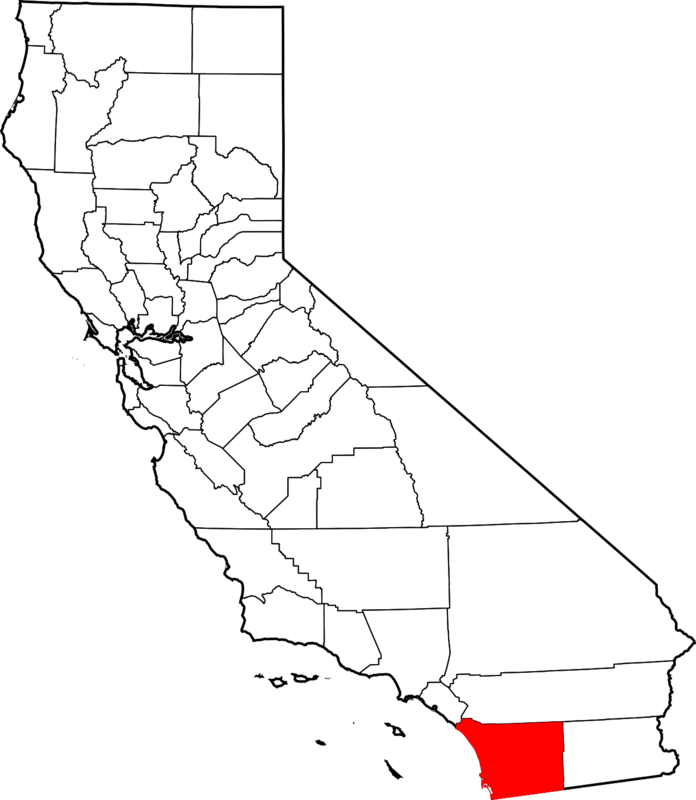 The County is bordered by Riverside County and Orange County to the north; Imperial County to the east; the nation of Mexico to the south; and the Pacific Ocean to the west. The County’s western portion includes 18 cities, while in the unincorporated area specifically designated sub-regions and community planning areas encompass the remainder of the County. A majority of the land in the unincorporated area is open space or undeveloped and includes large tracts of federal, state, or regional parklands, and agricultural production areas. Residential land uses account for the majority of the developed land in the unincorporated County. Relative to the incorporated areas located near the coast, development opportunities in the unincorporated areas of the County are generally more highly constrained due to more rugged terrain, more occurrences of sensitive species and habitat; and less opportunity for the provision of infrastructure and essential services. These physical, environmental, and infrastructure considerations, particularly the limited availability of water service from the County Water Authority (CWA), and the limited availability of other urban services such as sewer, fire, and emergency services, are major factors that shape the County’s future growth and development potential. GREG COX (R) was first elected to the Board of Supervisors in 1994. He began his career in public service as a teacher for the Sweetwater Union High School District. He was elected to the Chula Vista City Council and later served two terms as Mayor. A former President of the California State Association of Counties and President of the League of California Cities, he eared a bachelor's in Social Sciences and a masters in Education Administration from San Diego State University. He is married to Cheryl Cox, the Mayor of Chula Vista, and they have two grown daughters. DIANNE JACOB (R) was first elected to the Board of Supervisors in 1992. Prior to her election, Jacob was a teacher in the East County and a member of the Jamul-Dulzura Union School District Board for 17 years. She was active in the California School Boards Association and served as its President in 1987. A 3rd-generation Californian and San Diego native, she holds a bachelor's in elementary education from San Diego State University. She resides in Jamul with her husband, Paul. They have one adult son. 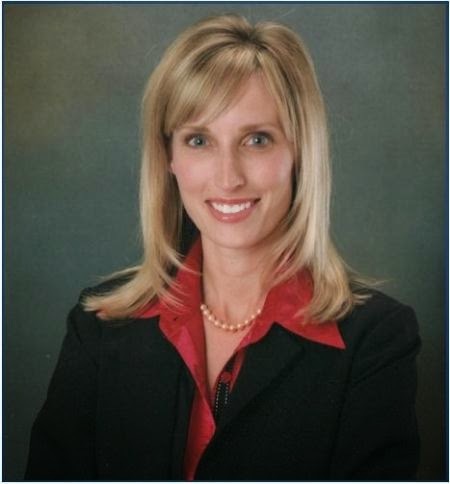 KRISTIN GASPAR (R) was elected to the San Diego County Board of Supervisors in 2016, narrowly unseating incumbent Dave Roberts by 1,272 votes in a 50.28%/49.72% contest. Roberts had been embroiled in controversy after the Board paid out $310,000 to settle claims made by former employees alleging inappropriate use of County funds, promoting a hostile work environment, realiation against staff members, and several other issues. 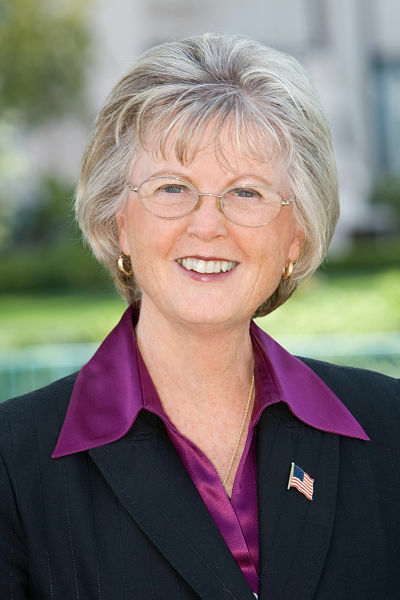 Prior to her election, she served on the Encinitas City Council, first winning election in 2010 as the youngest person ever elected to the council. She is the CFO for Gaspar Doctors of Physical Therapy, which opened in Encinitas in 1994 and is owned and operated by her husband, Paul, a former director of the California Physical Therapy Association. She holds a bachelor's in Journalism from Arizona State University. She and her husband reside in Encinitas. RON ROBERTS (R) was first elected to the Board of Supervisors in 1994. Prior to his election, he served two terms on the San Diego City Council. A Massachusetts native, his family moved to Linda Vista and lived in public housing for a time. After working through college as a supermarket clerk, he hearned a bachelor's from San Diego State University and a master's in Architecture from UC-Berkeley. He embarked on a 20-year career in architecture, spending most of that time as managing partner of a San Diego based firm. He volunteered for numerous civic positions, and eventually landed on the San Diego Planning Commission as chair. He resides in San Diego with his wife, Helene, a former school teacher and director of community relations for UCSD Mdical Center. They have three grown daughters, and several grandchildren. 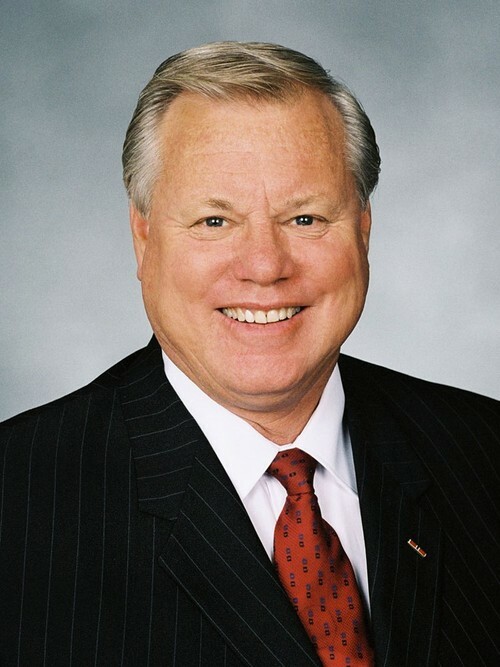 BILL HORN (R) was first elected to the Board of Supervisors in 1994. Born in San Diego and raised in Pacific Beach, he graduated from San Diego State University. A student organizer and civil rights activist for CORE, Horn worked as a reporter for the Business Extension Bureau and as a pilot for Gibbs Aviation during college. Following his graduation, he enlisted in the USMC and was commissioned as a 2nd Lieutenant. He completed his military service at the rank of Captain, winning a Bronze Star, a Purple Heart, and numerous other decorations. After the fall of Saigon, Horn began sponsoring what eventually numbered over twenty Vietnamese refugee families. In the mid-80s, Horn spent time in Israel as an agricultural and financial advisor to a kibbutz. He has served as Board member of the San Diego County Farm Bureau and as a member of the 76th Assembly District Education Committee. In 2000 he made an unsuccessful run for the US Senate, finishing 3rd in the March Republican primary with 15% of the vote. He resides in Valley Center with his wife, Kathy. They have three children.